Resorts World Sentosa is a tour de force of design displaying the breadth of MGA’s and MGDG’s practices. The 3.5 million-SF integrated resort includes 6 hotels, casino, ESPA spa, 1,600-seat theater, outdoor performance venues, retail and food & beverage outlets, convention center, marina, marine life park and the Maritime Xperiential Museum. A Universal Theme Park occupies the adjacent property. MGA developed the master plan that helped the developer win the project, designed all of the buildings, most of the interiors, and, with MGDG, the signage, furniture and furnishings. One of the hotels, the Hotel Michael named after Michael Graves, is an entirely Gravesian experience. Rather than create a resort that looks as if it could be anywhere in the world, MGA emphasized the local tropical character and created an evocative context where buildings and landscape are integrated into a warm, family-oriented resort that both entertains and educates. Its environmentally sensitive design received a BCA Green Mark. The cylindrical Crockfords Tower pairs with Hotel Michael to frame the view toward Sentosa’s iconic colossal Merlion statue from Universal Plaza and Festive Walk. Like Hotel Michael, it features an iconic roof, a hill-like green dome. The 9-story building, an all-suite exclusive hotel of 120 keys with mansions on the penthouse level, was designed to reflect the highest level of luxury and sophistication. The Crockfords is a contemporary version of early 20th century luxury. The guestrooms combine a sleek modern aesthetic with warm sumptuous materials and deep rich colors. The furniture, with its inlaid wood details and the table lamps, were designed specifically for the suites. In general, the interiors display a level of personalized luxury that connotes both power and pampering, reinforced by features such as adjustable lighting that allows a variety of moods and sensuous experiences. MGA designed the hotel restaurant and bar at the Crockfords as well as the casino and numerous restaurants located below the hotel. The L-shaped Festive Hotel creates a large courtyard to the west of Crockfords Tower. Its pitched roofs, terraces, and awnings, and the use of lattice and other small-scaled wooden elements reinforce the building’s tropical character. A central pool court features a tropical water garden. The family-oriented, 390-room hotel includes a children’s arcade and family restaurants. The Festive’s interiors, true to their name, are fun and vibrant, from the colorful lanterns in the lobby to the Brazilian restaurant, which captures the fiery characteristics of Carnival. The guestrooms are also playfully modern, with bold colors and oversized orchid graphics. They feature a separate sleeping chamber and a family-friendly loft bed in the sitting area. Associated with the hotel are a high-end retail arcade and the Festive Grand Theater, which doubles as a theater for the resort’s resident show and a plenary hall for conventions. The facility has permanently tiered seating for 1,600 and a 1,500 square-meter stage. The Hard Rock Hotel, a complex of guest accommodations with 360 keys, is located adjacent to the RWS Ballroom and Convention Center and various entertainment venues, creating a lively synergy of related uses. In this hotel, the tropical character of the resort’s architecture combines with dramatic light features that suit the glamorous, entertainment-based Hard Rock brand. The RWS Ballroom and Convention Center below the Hard Rock adjoin the Festive Grand Theater and share prefunction space. The 65,000-SF ballroom seats 7,300 theater-style and 5,500 for banquets. Its gridded ceiling with custom-designed star light fixtures, organizes the space, even when subdivided. The associated 30,000-SF meeting complex has a bright and airy interior open to private terraces and gardens. The Coliseum, a 1,014-seat theater for concerts and events is located on Universal Plaza at the eastern edge of the Hard Rock Hotel, where it provides visitors with an immediate, vivid impression of large-scale show business. The view of Resorts World Sentosa from Singapore and Cruise Bay focuses on the waterfront Maritime Xperiential Museum, Marina and Showplace Theater. The Museum is an iconic structure inspired by sea-going vessels, alluding to the stories told in its programs and exhibits created by designer Ralph Appelbaum. Throughout the day, dappled light and shadows cast by the ribbed frame will enliven the interiors. West of the Museum, a small marina will display examples of sailing vessels. The Museum and Marina are thematically linked to the adjacent outdoor Marine Life Park and form part of a rich tourist experience focused on the sea, marine life and maritime experiences. Also along the waterfront at the base of Universal Plaza is the Showplace Theater, with large stone steps creating a seating area for 2,000 people. With views across the bay to the main island, this is the location of a nightly sound and light show in the water, called the Crane Dance, which epitomizes the fun and drama of the resort. The West Zone of the Resorts World Sentosa, beyond the Marine Life Park, is a landscaped development, quieter and smaller in scale than the central zone. The West Zone will be a more exclusive setting for visitors to Sentosa looking to escape the hustle and bustle of daily life and enjoy the landscape or the beach. Here one finds the Equarius Hotel, the exclusive ESPA Spa and Spa Village, and the luxury Spa Villas guest quarters. The Equarius hotel, with 360 keys, is located at the edge of the Marine Life Park and very much part of the landscape experience. The adjacent Equarius Water Park abuts the rising terrain of an existing park with its beautiful trails and heritage trees. Located between the main hotel building and the rising slope of the hillside are two tree house suites, elevated on stilts and featuring rustic wood construction. The rustic architectural character of the Equarius property thus reinforces the experience of its tropical forest setting. An extensive ultra-luxury spa operated by internationally acclaimed ESPA is located in the southwest corner of Resorts World Sentosa, nestled against the hillside and facing the beach. The spa’s main building of rough stone and wood continues the association with the natural environment seen in the Equarius Hotel. The adjacent Spa Village of freestanding structures, with deluxe treatment suites, palace suites, and a wellness center redefine luxury. An exclusive beachfront hotel contains 40 guestrooms either constructed on the beach or standing above the water on stilts. The gracious guestrooms are generous in size and have large and well-appointed bathrooms and terraces with plunge pools. The villas are constructed of natural materials and designed to be as open as possible, with wooden louvered sliding walls. Their architectural character and informal lifestyle bespeak the relaxing atmosphere of beachfront living. 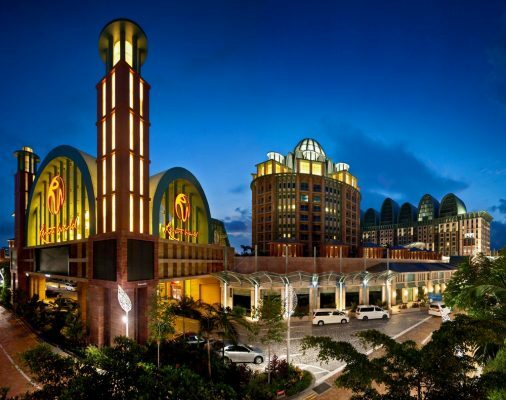 MGA has provided for numerous retail facilities located throughout Resorts World Sentosa, within the hotels, lining Universal Plaza, a large open space at the entrance to the resort and the theme park, and in The Forum. Associated with the Festive Hotel and adjacent to the casino, the Forum is a double-height retail environment featuring high-end stores, including several international brands that are new to Singapore. In addition, Festive Walk, located between Crockfords Tower and Hotel Michael, is a large semi-enclosed eco-cooled space covered by an extensive canopy, which includes retail and restaurants. This area has the atmosphere of a festive village, with restaurants and other food and beverage outlets spilling out into the center space and featuring water, music and light shows in their midst.